Left foot forward (a journey into reenactment): Questions, questions..
..and the answer is; white shoe polish. 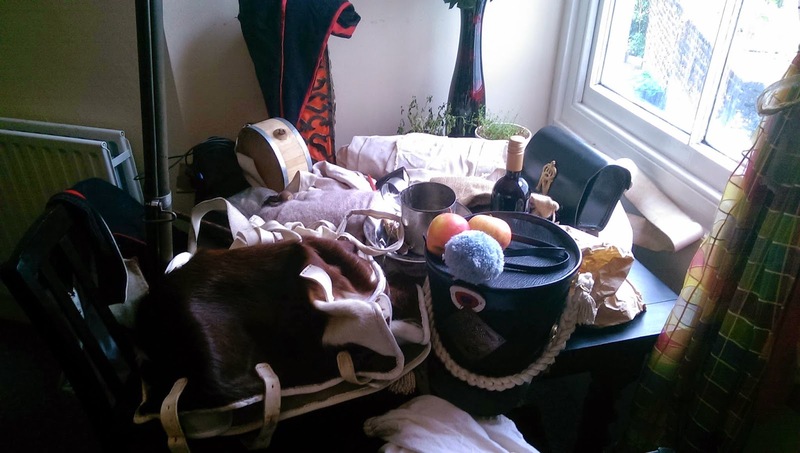 I am going to an event tomorrow and doing my usual sort out and tidy up. 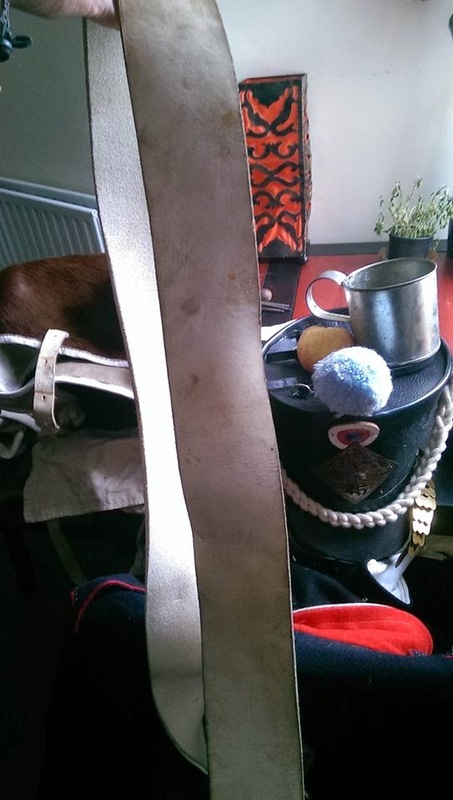 Had a bash at the musket with fine sandpaper to remove any rust I could find, which was only really around the pan and frizzen and half of that was powder discolouration that came away, hey, I'd forgotten the pan was actually that colour. Then I took out my giberne and, oh dear, that crossbelt used to be white.. indeed I thought it was last time I put it away, sort of. (actually it dosn't look that bad in the photo, and against a blue jacket may appear lighter). So I looked it up on the internet, and amongst other suggestions using white leather shoe polish seemed the commonest. I have learnt something else. About a month ago I had to look up 'how to clean mildew out of fabric.' Mainly boiling water, bit of bleach or vinegar, and sunlight... after discovering the damp days at Painshill had left my bonnet de police open to going abit mouldy on the insides. Not much I can do with the crossbelt today then.I tried one suggestion of fine sandpaper but it seemed to be just eroding the leather, so best left. It was a nice surprise to see the familar sight of my own regiment on the website banner too, at Living history worldwide. infact the photo made me want to illustrate pretty much what I will be taking... most of the clothes are rolled up on the chair but the main space taker is the blanket and the canvas, water/drink and the greatcoat (not pictured) if I end up taking it.. although if I think I will need it I will probably wear it.. wearing as much as possible is always good.. and then the sun will come out. 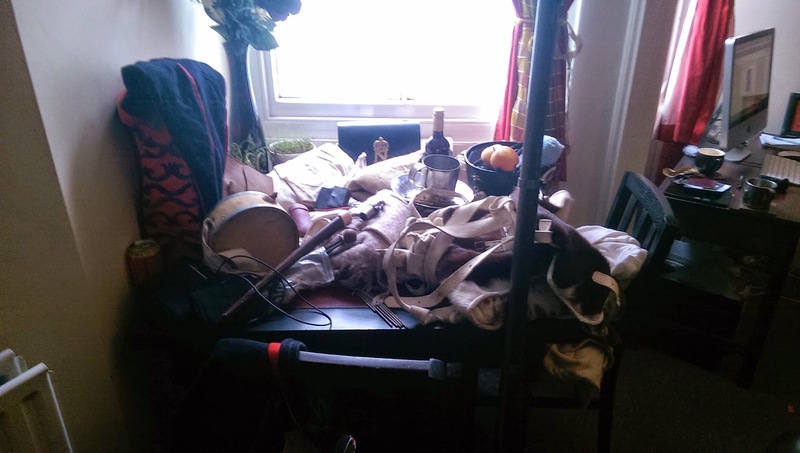 In total; Musket, in musket bag, bayonet, canteen, tin cup, plate, knife and fork, leather document pouch, cartidge belt (Giberne), notebook/pencil, bonnet de police, shako, canvas and pegs, musket tool, hessian sack, blanket, money/card/key pouch, medicine pouch, phone charger, phone, botttle of wine, loaf of bread, wedge of cheese, two apples, fruit cake, musket cleaning kit, spare flints/pricker/rag, spare trousers, glasses/case. The shako is a bugger unless you carry it too, I do wonder why they became popular with almost every army.. one minute bicornes (which must be far cheaper and easier to make) then suddenly shakos are the thing, with all their trimmings, plates, chords and pom poms. Last weekend I had intended to go to Colchester Military tournement, a big multi-period event, I had uhhmmmed and arrrghed abit over this one because of distance and having a lot of other things on that weekend.. but decided to go, as we were short of numbers, especially firers. However when I went to buy train tickets in advance I was told engineering works were rife and this would have further put the kabosh on things, indeed a friend of mine who went with his Saxon group said their were practically no trains on the Sunday, so maybe I dodged a bullet. 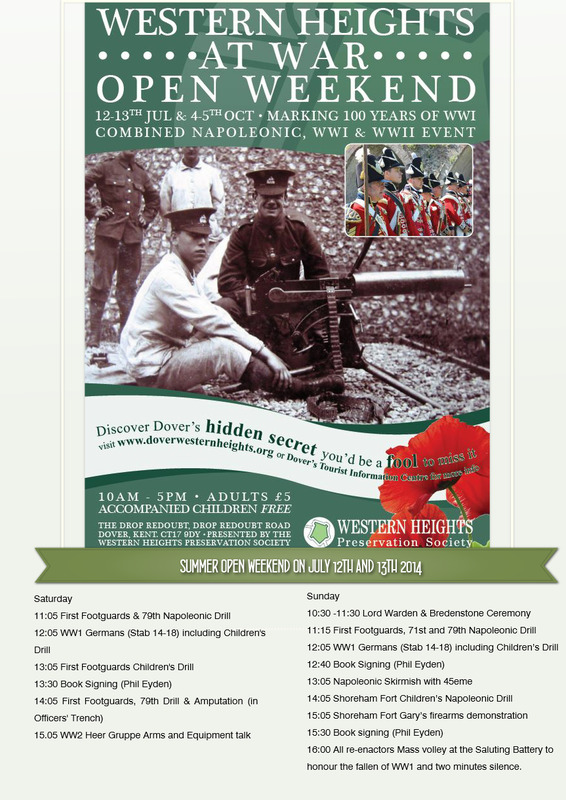 Tomorrow is a return to Dover Western heights, which I went to last year (the 45eme are there on Sunday but the event is both days), and the weather is set to be wet. The rolled up item at the back of the picture is my canvas and I am wondered whether to take it, probably yes, but my hopes will be to find a roof.. even if it only has three tumble down walls of an old casement round it. Doubtless you will hear next week! Also tomorrow is a Battle prom at Blenheim house.. I would really like to get to one of these for the whole show, skirmish, parade, music.. with added cannons.. and firework finale but which ever way I came at it logistically it was a journey up to Oxfordshire and up to the park and back, the earliest I could have left and got back to Brighton (to get up early for first train to Dover for the Sunday) would have meant only getting about half an hour of the prom and with getting-from-country-house-to-train-station worries possibly marring that. so probably for the best I concentrate on Dover. and get on with packing. Now.